It's been put off for long enough. As a critic and commentator, there are certain "holy mountains" one is expected to scale at least once. In writing about film, for example, a confrontation with "The Birth of a Nation" (1915) is both ritualistically expected and necessary, not only because it is a landmark film but because it is one of those moments where everything about the cinema crystallizes into one coherent moment in time. Because it's impossible to ignore Griffith's film, one must grapple with it and, inevitably, find oneself both desiring and fearing the process. 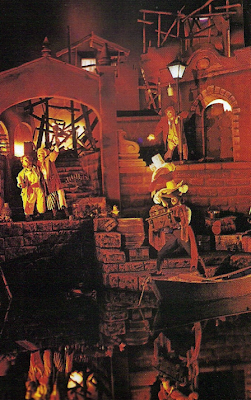 Pirates of the Caribbean is the "Birth of a Nation" of themed design, the moment where the concept of a ride through attraction that began so humbly and so long ago - as metal cars scooting along on tracks in darkened rooms - finally crossed over into the rarefied world of art. It is the moment where everything about themed design and what is possible in it crystallized into a single master stroke of an attraction, still the one to beat all these years later. 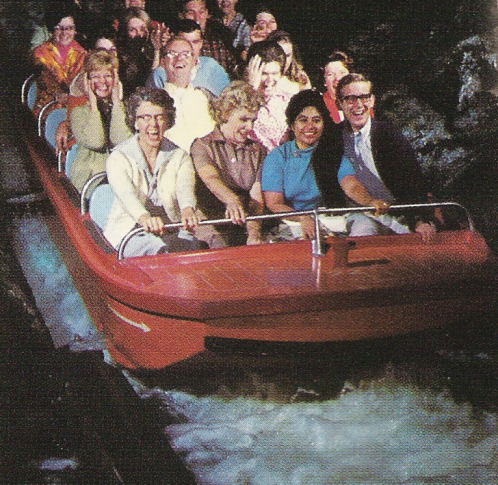 In 1967 it plumbed new depths of the possibilities of a theme park attraction. It created the public perception of a Disney attraction as a lavish, lar ger than life spectacle. It was Walt Disney's final project. Riding it is like going to church, that's how strong the tidal pull of fascination it exerts is. It may as well be a national monument. Other attractions may have more superlatives to their names: Haunted Mansion may be more rich in fascinations; Horizons may be more ambitious and complex. But there is nothing like the original version of Pirates of the Caribbean, at Disneyland or anywhere else. It is unquestionably the greatest attraction ever made. And with that comes a problem, which is that in the high regard we give it, it often seems unapproachable. Certainly, even on this site beyond a few call-outs to it as a touchstone experience, I have resisted going too deep down the flume into the subterranean areas below. Despite this I will admit that Pirates of the Caribbean at Disneyland was the galvanizing experience that compelled me to begin to think critically about a themed design experience; in that way it both changed my life and means that much of the writing on this site rests uncomfortably in its long shadow. If you have not experienced the Disneyland, 1967, full strength version of Pirates of the Caribbean, please do not read this essay, because I will ruin the ride for you. Such a dynamic work needs to be experienced with a fresh mind instead of through the lens of an academic "reading", which is what I am about to attempt. Please preserve this wonderful experience for yourself. Okay, then: I have a final admonition in this preposterously extended prologue. For those of you playing along at home, it may be worth noting here that this essay is intended to sit alongside my piece about the Florida Pirates of the Caribbean, but in reading both one may note that my message is somewhat conflicted, in that elements I highlight as strengths of the California show in the text below are the things I praise the Florida show for eliminating. I'm not being hypocritical; I'm recognizing that both attractions are unique entities that play by different rules. While I don't think this is a bad thing it does contribute greatly to the misunderstanding and scorn the Florida Pirates receives. Because a California native imposes a "West Coast Reading" on the East Coast ride doesn't mean that the designers had any such inclinations in mind. The rides do, after all, have unique strengths and weaknesses. For example, to call out an example from another attraction, Disneyland natives almost universally praise the trim exterior and stately entrance room of the Disneyland Haunted Mansion because it means that the attraction only becomes strange and "haunted" when the elevator begins to descend in the stretching room scene. That's undoubtedly a powerful moment but the Florida version simply doesn't have it; there's a bat weather vane on the house outside, a howling ghost dog, and an aging portrait in the entrance area. These aren't weaknesses of the Florida show, it just means that it is doing something different. 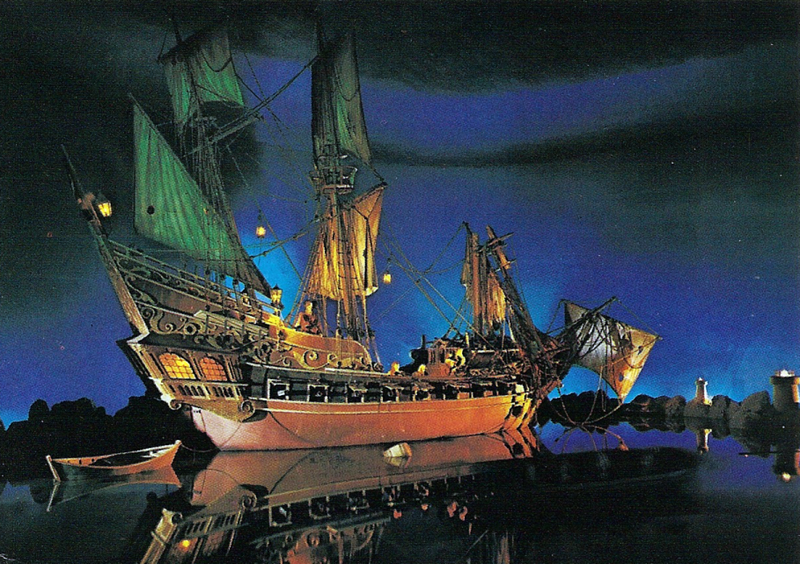 What all of this means to say is that Pirates of the Caribbean, more than almost any major canon Disney ride, indicates that there is no single "right way" to do themed design; there is no single platonic solution that solves everything, even when one version of the sum total effort achieves near perfection. Some strict design elements in this, the greatest attraction ever made, were later straightened out and improved, and they happened for the 1973 "inferior" model. This itself proves the fallacy of comparison, the uselessness of playing that age old game. I say we let each work stand or fall on its own strengths or weaknesses, because the integrity of the individual art piece is, in the long run, far more important than its place in a canonical progression of the history of the form. The wiser youngsters of today: so be it. Pirates of the Caribbean is its own national myth. It was born relatively recently - 1967 - but it has become as eternal as George Washington and his apple tree and the stories of Johnny Appleseed. In other words, it has become a popular legend, perhaps moreso than any other Disney product. Walt Disney Studios has spent much of its life enshrining American myth and legend, in doing so replacing the original with the popular art incarnation of it in the public imagination, but in one of Walt Disney's final acts he created his own national myth, stitched together from castoff bits of cultural debris, and in the last forty-five years it has gained an astonishing amount of cultural currency. Yet this final, penultimate success was not won on the shoulders of any one recognizable established cultural figure, not in the way that, say, the Great Moments With Mr. Lincoln show piggybacks on the American obsession with the sixteenth president. Instead, Pirates of the Caribbean draws from a more ethereal set of influences and thus seems to be the zenith of the entire cultural concept of high seas piracy. This accounts for its cultural longevity, perhaps, even as works like Treasure Island and Captain Blood seem to echo down through those caverns. It reminds us of them but also seems to sum them up, to synthesize everything about those pieces into a whole which draws upon our collective unconscious even while breaking expectations and forming new ones. Because it is original yet draws on every trope and tradition of pirate lore possible, Pirates of the Caribbean supplants them all as the definitive popular culture text on piracy currently in circulation. The search for pirate gold is one of those myths that refuses to die. 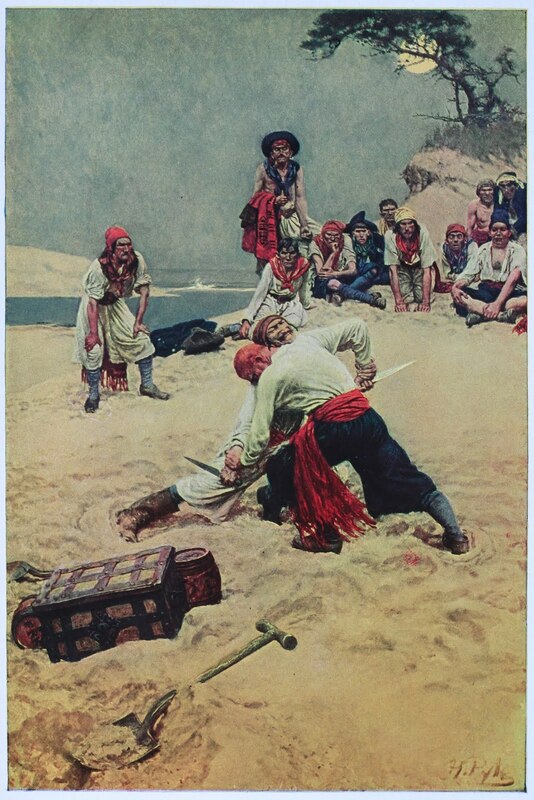 Its roots surely predate Mark Twain when he wrote of Tom Sawyer and Huck Finn marauding downriver and lifting the plundered gold from Injun Joe's Cave, although that may have been the text, along with Treasure Island, which most strongly fixed the image in the minds of the generation of artists who built the attraction, Walt Disney amongst them. Truthfully, the buccaneer gold business been going on for centuries now. 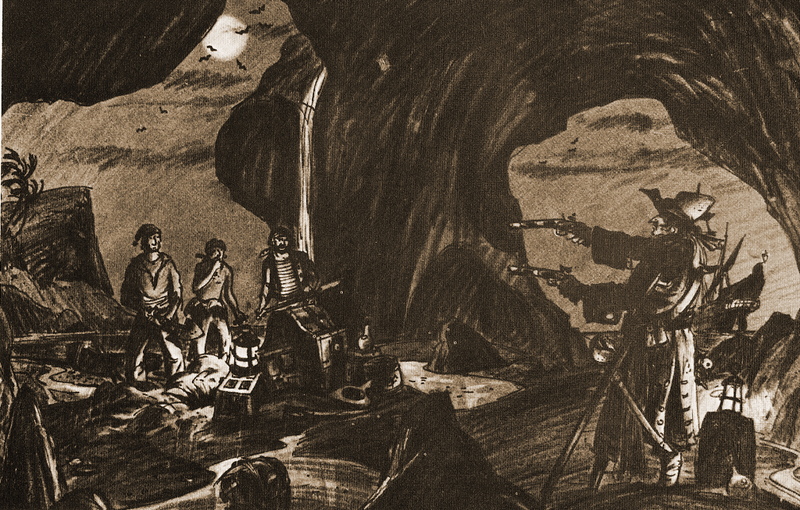 Besides Captain Kidd, who buried treasure up and down the east and gulf coasts of the popular imagination, there was Thomas Veal, who entered a cave known as "Dungeon Rock" in Massachusetts to retrieve a hidden hoard and never came out. He was likely buried alive with his gold in the New England 1658 earthquake, making Veal a deep source for Davis' famous Treasure Scene in the mystery caverns. One man, Hiram Marble, spent sixteen years and his entire life's savings digging into Dungeon Rock looking for Veal's motherlode. And of course Blackbeard has kept the citizens of North Carolina busy for generations looking for his ship and/or riches. These are very strong inherited images, and the American tradition of searching for pirate gold (these are pirates of the Caribbean, not the Atlantic), informed by the evocative images supplied by Louis Stevenson, of Ben Gunn's caves and the skeleton of Allardyce, the human compass, combined to create the "mystery caverns" which begin the attraction proper. Indeed, we would be surprised to not find pirate gold down in those caves, and the attraction (at least in California) does not disappoint. This sequence exploits our pre-existing cultural knowledge of piracy to achieve its effect. In the way that the final attraction draws less on specific influences than it allows you to "experience the idea of pirates", in Davis' succinct phrase, it simultaneously shrouds itself in myth to the point where it seems like it may have always existed. 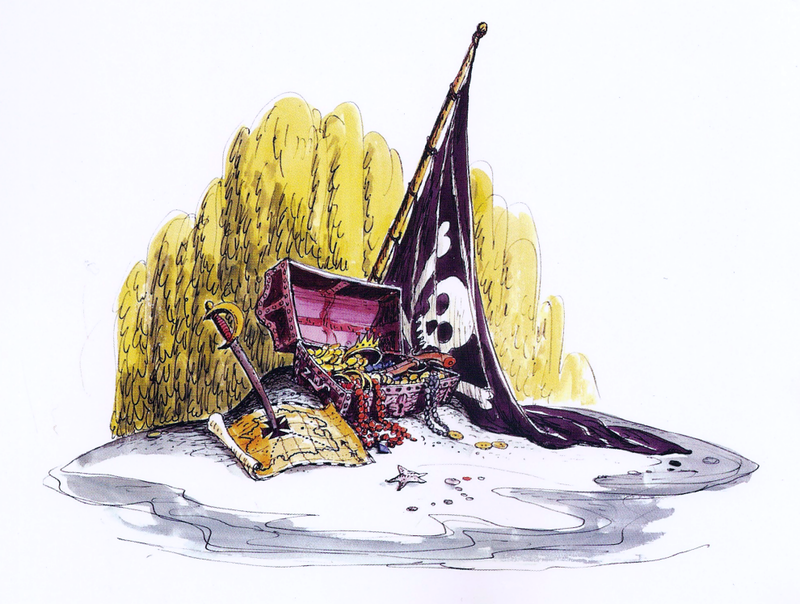 The first thing presented in the attraction's entry area is a beach strewn with a map, treasure chest and jolly roger as if to hint that treasure may be buried below - a visual abstraction of our conception of lost pirate gold. Behind it, a cascade of leaves forms a curtain which seems to shroud the rest of the attraction from view. 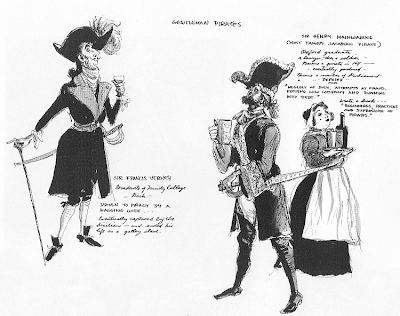 Along the walls are painted Davis' abandoned concepts for historical pirates. This simple, mostly bare room - which features little more than a boat channel, a bit of queue and the aforementioned simple scenic elements - seems to summarize everything one may expect to see in a pirates ride right off the bat: "Here's all the icons in one place, now watch us do something else." And they do, of course. With the obligatory imagery out of the way, Pirates of the Caribbean succeeds as a riff on the entire cultural concept of pirates and seems wholly original yet still familiar as if we knew of it all along. Indeed, as proof, there are few people today who don't seem to secretly believe that X Atencio's famous "Yo Ho" song isn't an authentic sea shanty. And yet in another way the simplicity of the entry room has another effect, one probably unintentional: it is like a bare stage on which the essential props of the drama are placed before the audience, or the opening statement of the magic trick that frames the rest of the illusion. You enter a building; you are inside... but not. In just a few meters, inside space becomes outside space and day is twisted into night. It is one of the essential magic tricks in the themed design lexicon yet that simple opening chamber frames the whole trick and grounds it in reality. Even as it provides the basic elements of a high seas adventure it's the setup for the illusion to follow. There are drawbacks to this cultural familiarity, however, which have obfuscated certain parts of the attraction and diluted their impact. One of these facets which we risk losing sight of is an attraction which poses its action as a parable which is told as a mystery. The pirates will all perish in the burning city or else each others hands after the treasure has been lifted; these men are doomed. We only come to their story by little, tiny remnants which may be pieced together in retrospect. Consider how the Disneyland attraction withholds its pirates for an astonishing length of time; we enter the attraction with the promise of pirates and signs of their presence are all about; following the very first drop we now hear the pirates singing and expect them to be around the next bend. We do find them after another waterfall, but they're dead. It should be a sobering moment in an attraction which promises pirate frivolity. 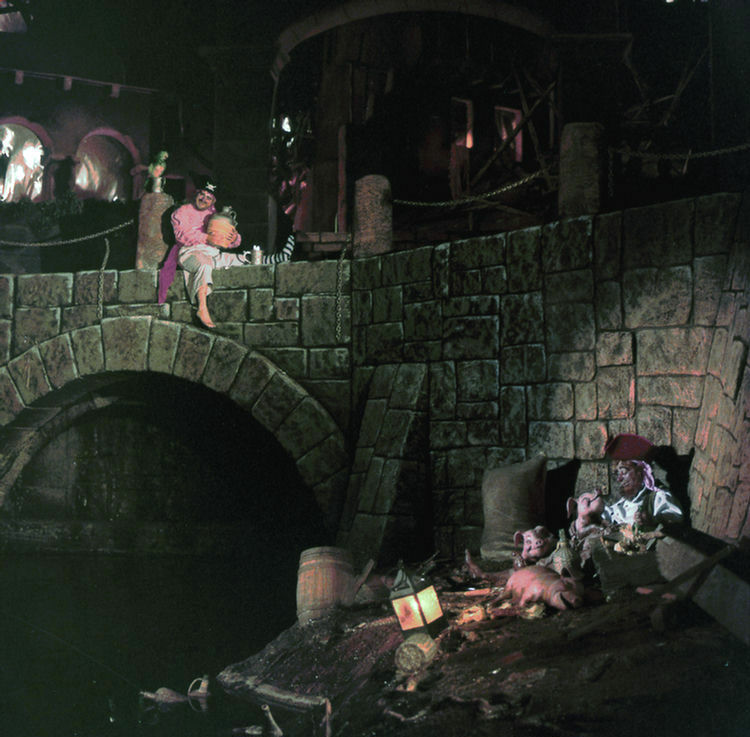 As the first major scene in the attraction proper, as the first sign of pirate life we've yet seen, Dead Man's Cove offer only death and decay and establishes the grim morality play to come. Because we know the brigands can never outrun this fate as ghosts and ossified bones, it casts a long shadow over the attraction. This is the necessary editorial perspective, why it is possible to frame the debauchery that follows as actions that will have consequences. It is a judgement, and it should be a bucket of ice water in the face to any rider paying close attention. One of the great strengths of the Disneyland ride is the looping rising action which seems to be constantly cheating towards the primary action from odd angles, always teasingly oblique. For an attraction with such a strong, exciting name as "Pirates of the Caribbean" that it can now be used to market action movies, the show spends forever moseying about the periphery of the concept. We begin in a nighttime bayou under a sign that only vaugley hints at what's to come - Laffite's Landing - before we're off into the bayou and the mystery begins. Why are we here and where are the pirates? Over the years, thanks to the internet, it's been very easy to find speculation that the "old man on the porch" scene in the Blue Bayou represents Jean Laffite himself. Of course this is nonsense, but it's nonsense we can learn from. Where are the pirates and what is the bayou? The name itself is our clue here, for the name "Blue Bayou" was not accidental and does have an precedent in the world of Disney. Familiar Disneyland images... but not from Disneyland! What is the Blue Bayou? It was the name of an animated short intended to be part of Fantasia, originally meant to accompany "Claire de Lune". Because Fantasia was so long, it had to be excluded, but Disney finished the thing anyway in 1942 and sat on it for four years, finally releasing it with new music by the Ken Darby Chorus as part of "Make Mine Music". Yep. 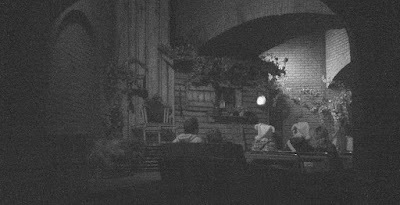 But when you watch Make Mine Music, what's the very first thing that shows up onscreen during the "Blue Bayou" segment? A title card reading: "A Tone Poem". That's the key: the Disneyland Blue Bayou is a tone poem, a throwaway loveliness that opens the heart more than it develops the action. It is a necessary prelude to the attraction that follows because it sets up the central mystery by deferring our expectations. Where are the pirates? 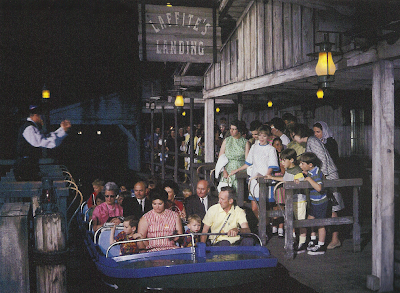 The first person we see on the ride is the old man in the bayou; could he be a pirate? The ambiguity lingers in our minds. The Bayou serves the same purpose as the opening title crawl at the front of a film: it is the buffer between our reality and the nocturne to follow at the same time that it raises a central mystery and a growing sense of unease. It allows us to calm down, get settled in, and look and listen; to truly absorb. This is a neat trick because following the Blue Bayou, we come across maybe the best hundred feet of track ever put into any themed design show ever, and what's most amazing is how this is accomplished with essentially nothing. 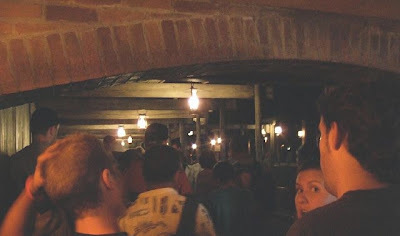 Just as the entry room acted as the attraction's overture, expressing central themes, and the Blue Bayou is the prelude to the strum und drang to follow, a mood of quiet contemplation and anticipation rather quickly gives way to dread as we pass through the brick arches into the darkness. Now, suddenly, there is almost nothing to look at or hear as the bayou sounds fade away and are forgotten. 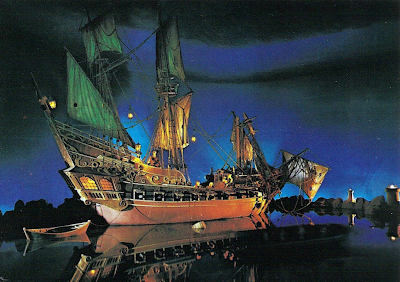 Now, it is one thing for an attraction to promise Pirates and not immediately deliver; it is another to not even offer scenery to admire as we press on into the darkness. The questions loom larger. Here Pirates of the Caribbean accomplishes something no other attraction ever has, to my knowledge: it utilizes a whisper in the darkness. As both eyesight and hearing fail us in the dark tunnel, we slowly hear and then, by dint of its solitary nature, strain to resolve a human voice seeming to speak barely above a mumble. Our senses effectively reduced to just one, we latch onto that voice and narrow our focus onto it like a laser. Who is speaking? Will it be a hero or a villain? The design of the tunnel adds the unsettling dimension of making it impossible to guess from whence the voice issues: is it in front of us, or behind us, or to the side? Surely, now, we will encounter the Pirates of the Caribbean. This is pure gothic horror stuff. A whisper in the darkness is just the sort of thing you never want to hear late at night when your defenses are at their lowest ebb. There are abstract visuals to confuse us as we move through the darkness: an unexpected lantern, a door and a window that seems to promise some logic to this deepening dream. Just before, as a sort of setup we saw the old man rocking outside of his apparently inhabited cabin, the only human characters we've yet encountered, but the pattern betrays us. The voice does not speak from beyond the door; there is nobody home, and as we turn the corner we discover that the voice issues from something that can hardly even said to be human. It's some sort of ghoulish apparition, a disembodied head issuing confusing commands at the apex of the very last brick arch. The mysteries deepen and now have tipped over into what is unambiguously a ghost story and, like Alice, we are pulled down the rabbit hole deep into our unconscious. The drop leads to a cavern where we expect to find the pirates once again, but once again we are deceived; the buccaneers have rotted away; all that's left are their voices. Even those betray us, as the rousing song becomes an echoed warning that "dead men tell no tales", that the dead will not give up their secrets so easily. 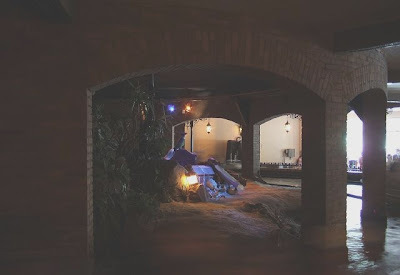 The cavern itself is interesting in how quickly it establishes an understanding that we are now under the city; roots push through the ceiling and as jaunty as the song is, the setting is even less reassuring than before. The memory of that fades with the second drop. The attraction has at this point thoroughly demolished our expectations: day has turned into night, inside has turned into outside, pirates have turned into ghosts, and we are now not even sure of where we are. So as we pass the bleached bones of the brigands, the mystery and ghost motif kicks into high gear; most all ghost stories are mysteries, after all. Discover the reason the ghost is here and the dead can be sent back to their rest and the natural order restored. This works for everyone from Pliny the Younger, through to Shakespeare, and on to Stephen King. We the audience become investigators, looking to clues amongst the detritus of the pirates underground stronghold as the mood shifts from mysterious to foreboding to darkly comic. The skeletons are faintly funny, their human-like positions and activities only pointing out their status as corpses ever more clearly. They drink rum, they count money, and a piano plays itself, obviously typical ghost business: the same gag was used in the Florida Haunted Mansion just a few years later and the instruments even look similar. The caverns themselves speak as eloquently and essentially subliminally. The mere act of plunging underground into a cavern carries with it a wallop of associations which play on us just as strongly today as they did on their creators in the 60s. We not only bury our dead in the ground but we know from a host of literature from Plato to Dante to Milton that the underworld is down there, too. Like Orpheus, we will confront the dead. And just as Dante's inferno was more about Dante's soul than the blazes around him, we perhaps can expect to uncover hidden truths in this pirate underworld. The descent underground and twisting path through the caverns is as surely into our own subconscious dream state as it is to any place literal. The caves ultimately cannot be localized under the city of New Orleans or any other place because they are our one step beyond: underground, apparently open to the ocean, full of water, storms, falls, beaches, bones and dust. Lulled into accepting this impossibility, we are prepared for the next. And then we reach the attraction's first climax, the treasure horde, which is positioned last in the sequence not only to send the "mystery" sequence out on the strongest visual but to give us the impression that we've found the pot of gold at the end of the rainbow. Immediately after this visual, the attraction shifts tones for the fourth time as we apparently travel back into history through yet another dark tunnel with echoing voices to finally find the answer to the question of how the pirates met their doom. I make much of the fact that X Atencio wrote narration for each of the scenes in the "Lower Grotto" sequence, but these narration pieces were never used. The scenes are rich in fascinations, from the ghostly sounds of revelry which still echo through the underground bar to the weird Victorian decor of the Captain's Chamber, and of course the images are self explanatory without really explaining much. We've arrived too late: dead men tell no tales. The ghostly voices which send us back in time are the very first pieces of expository narration we've yet heard and the attraction is by now nearly half over. All of this leads up to the Bombardment Bay scene, a suitably epic first movement for the show's second act, and it is impressive no matter which version of the show we see. But no other version spends a full six minutes preparing us for it by making us complicit in the act of getting there, six minutes full of intrigue, ghosts, and a mute chorus of rotted bodies. No other version denies us the pirates again and again, luring us deeper and deeper into the dream state until we find them in their ship, cannons blazing, as iconic an image of piracy as was ever presented. One of the things which makes Pirates of the Caribbean great is how it refuses, again and again, to manifest the very reason it exists, how slowly the petals open to reveal the flower, how gradually the icy grip of death yields its secrets. It is as perfectly orchestrated an opening to an attraction as has ever been devised. In six perfect minutes a high seas adventure becomes a ghost story that becomes a mystery and back again. By framing the main action as an investigation into history of a group of doomed men, the mantra "dead men tell no tales" never fades from our minds. It can be argued that the Bombardment Bay scene is like a hinge that the rest of the show pivots around. It is more or less the midpoint of the ride and, like most hinges, its action is symmetrical. We have been brought from a state anticipating piracy and adventure to a state where we are like crime scene investigators, trying to piece together the story from some time in the future. It is an enormous act of drama to bring us back in time to the "scene of the crime", then. We've spent the first half of the show watching the pirates materialize out of nothing, becoming skeletons and then flesh and blood, and from the Bay scene onwards we now watch them fade away back to skeletons. We anticipate and foreshadow the act of destruction then watch itself play itself out, bringing us back to where we started. Act Two of the show climaxes at the burning city; this is the pirates' biggest moment of triumph and revelry and, following the rules of classic drama, it is also inevitably the moment where their fortunes turn. If the Blue Bayou is the Overture and Prelude and the Act One is the mystery Caverns, Act Two can be seen as the "major action", the sequences the ride is built around. This act ends when we pass out of the burning city and into another dark tunnel for a short Act Three: Inferno. Fire symbolically destroys as it purifies, and we don't need any indication other than those swaying timbers and thundering silence that the crew has begun to perish in the flames. A circle is starting to close. This circular nature is one of the greatest pleasures of the attraction, one of the things that makes it as great as it is. In the mid 90s there were a number of additions which made the circular plot even more apparent, adding skeletons to the final scenes and a reprise of "Dead Men Tell No Tales", but in a way these were redundant. We understand on some unspoken level that the spell is reversing itself when we take that long, chugging ride back up the lift hill back to the bayou, it's an understanding beyond phrase or comment. We move up after having moved down and return to our point of embarkation, the musical Overture returns, the Bayou once again reasserts itself. Ever wonder about that sign? Maybe, why it's there? It is there because it makes the Load zone into a location, it fixes it in your mind. It's even a neat little alliteration, all the better to help you remember it. You're not just getting on a boat, you're getting on a boat at Laffite's Landing, dammit. When you return to that sign, a very satisfying sense of closure comes with it, a closure which helps point to the attraction's circular nature. Laffite's Landing may be the most important attraction load area ever because of that sign and the circular structure it points to. Make no mistake: all attractions, no matter how sophisticated, inscribe a circle, for specific, technological reasons. But no other attraction tells a narrative that is a circle while inscribing that circle, allowing us to connect meaning (narrative) to form (a boat moving in a channel). Pirates of the Caribbean is that Wagnerian aesthetic of the total synthesis of all the works of art into a single statement, the Gesamtkunstwerk. Other attractions may have separate load and unload areas and encourage us to see ourselves starting at one location and proceeding to another, different one: the Disneyland Haunted Mansion does this very effectively. But these attractions seek to obscure their circular nature, in Pirates of the Caribbean, that nature is given meaning and form. The events of the attraction happen in the past and are surrounded by signifiers that foretell their conclusion: the Pirates of the Caribbean will always perish at each others' swords. This is an event we can replay over and over again and access through a magic window, a portal to another time, a brick arch in the corner of the bayou that brings us somewhere new and nowhere at once. Attractions seek to create the illusion that what we see happens spontaneously, unpredictably, but not Pirates of the Caribbean, it is an impassive procession of a doomed history. Every time we ride the Haunted Mansion, or Mr. Toad's Wild Ride, or Snow White's Scary Adventures, there is an implicit "reset button" that gets pressed so the story can unfold its narrative from A to B again. Pirates of the Caribbean starts at A, goes to C, then back to B, then on to A. There doesn't need to be an excuse that the same thing happens every time you ride it because the events of the past are as fixed in time as that skeleton pinned to the wall of the cave. The visual treatment of the attraction can be our clue to appreciate this. If we accept the understanding I've posited that the attraction depicts an event of the past in a fixed cycle of destruction and it does this by bringing us back in time to replay some deep, unresolved trauma which still haunts the caves, then there must be some visual indication of this, no matter how subtle they may be. Some of the best art is created more or less unconsciously, and as similar efforts have gone forward to reveal the hidden concepts structuring the Haunted Mansion, we can find the same sort of thing within Pirates of the Caribbean if we peel it apart. We have already established the myriad purposes of the entry room, with its plain windows and plastered walls. It challenges us out of the "reality" of New Orleans Square to introduce signifiers of "the idea of piracy" and thus provides the visual overture to the attraction. There is another purpose, too, and since this simple room is the very first architecture we see that wholly "belongs" to the attraction, it's worth examining closely. It is, primarily, an empty room with a boat channel running through it; the boats are returning to Laffite's Landing from the attraction. 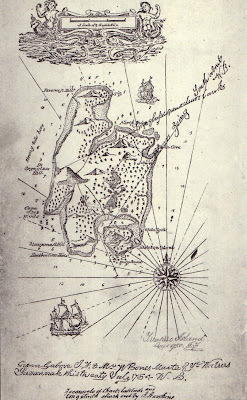 On both sides of the channel are arches, and the channel hugs the small island on which are placed the lanterns, chest, map etc discussed above. Behind these items is the "leaf curtain" that shrouds the Bayou. 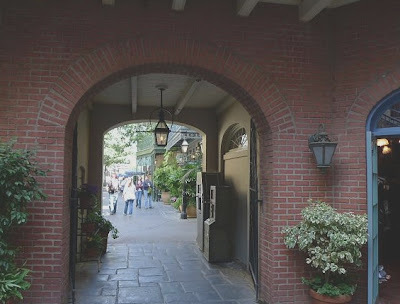 In this way we can see the return loop of the boat channel as a line dividing New Orleans Square from the Bayou and, thus, the "reality" of the square from the supernatural mystery it conceals. The arches indicate this. On the "square" side, nearest the entry doors, they are tall, thin poles with wrought iron brackets and details from which are hung lanterns in the Old French Quarter style. They "belong" to the Square. On the "Bayou" side are strong, sturdy brick arches through which the Bayou may be glimpsed. Both styles of arch, beach scene, and "leaf curtain" all visible in one image. ...are we transported into the fantasy forever-night of the bayou itself. Notice how the texture detail of the walls is different on each side of the arch in the photo above? These arches are a simulated sunset; as we move through them away from the brightly lit, windowed "Overture" room, we make our supernatural crossing into the bayou and, only then, can the story begin. Here's a diagram I worked up based on a fanmade blueprint downloaded from Flickr user Enfilm (which is an amazing resource, I may add). 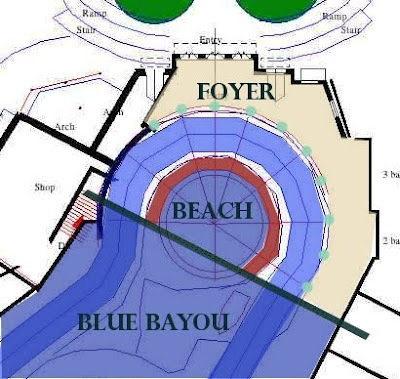 It's not really accurate but it does show how the two kinds of arches in this entry room divide "daylight" (tan area) from the "nighttime" of the bayou (dark blue area). Notice how WED could have elected to make those windows looking into the Foyer false windows or black them out, but they let daylight in anyway: this is all part of the showmanship of the Bayou illusion. It's a better trick if during the day that first room is flooded with Southern California sunlight. 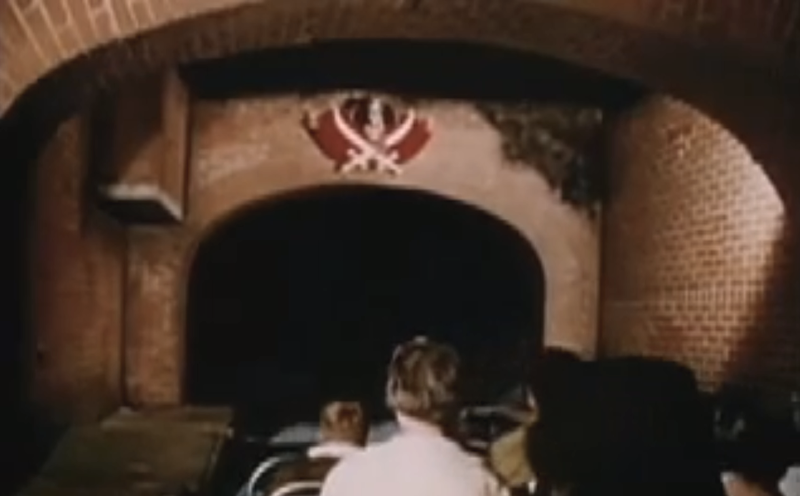 The green dots represent the wrought iron poles, the "New Orleans Square" arches, and that thick red line is the brick arches which divide day from night. The light blue boat channel moves between these. That brick arch we pass through is right at the solid black line dividing New Orleans Square from the dream state of the ride. This is literally the moment that the entire attraction has been building to, the reveal of the skull and crossbones, and as a frisson it is second to none. The skull is tellingly placed at the apex of the arch. This is where the keystone is placed; the wedge shaped rock which holds the arch together. Similarly this moment is the keystone moment of the attraction which holds it together: all those arches have been building away in the background, quiet signifiers of your progress towards the attraction's transformation into a ghost story. You've seen dozens of arches so far; but this last one, which leads to a drop and the inky darkness beyond, is the one that will do you in. Arches recur elsewhere in the ride, of course, and are used extensively in the Second Act to divide the various scenes. But one in particular, right, is very close to the brick arches used to divide space in the Bayou; indeed it is one of our "Magic Portals". It's the arch that divides Act Two from Act Three, and it's another dark stone portal capped with a prominent keystone and darkness beyond. From this point in the attraction on, the arches begin to return, even as the town burns around them: the arch shaped cells in the Jail scene, for example. The arsenal is full of them, usually with fire licking just beyond, and as we escape up the waterfall and back to the Bayou and Overture, we pass through just a few more, marking our return to the present through a very prominent red brick arch. The circle closes. All of these things contribute to the greatness of the ride, but the above has by no means come anywhere near close to exhausting the interpretive possibilities of this great, great dynamic work of art. For example I have steered clear of discussing many of the town scene in Act Two, these are the scenes that the attraction is built around and so have received the bulwark of critical attention. 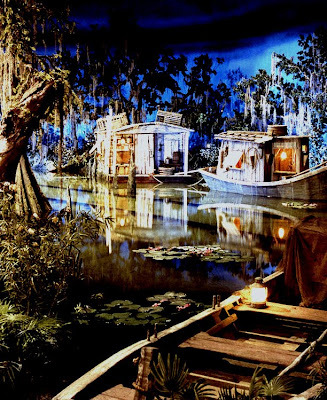 But in a way, the strongest moments of the attraction are those between scenes, in the quiet moments, as we slowly drift into the darkness of the bayou and the whispering voice can get to us. Or the leisurely rounding of a corner in the caverns as waterfalls splash around us to the left and right, or skeletal forms slowly materialize out of the darkness of a wind-torn ship. The uncomfortable quiet as we move under the creaking timbers of the burning city and are allowed to process the magnitude of the destruction. Or the almost full minute of darkness as we pass out of Act One and into Act Two, with no visual input whatsoever and the booming, taunting voices of the pirate ghosts echoing all around us. Pirates of the Caribbean may be the only theme park attraction to give us both time to regard it and then give us time to reflect on its brilliance in the spaces between scenes where things get very quiet and still. This surging push and pull between thrilling action and spectacle and quiet moments of reflection is what makes this ride such an indelible experience. Yet that Prelude and First Act, they're so central to the attraction that they nearly eclipse the rest of it. When lifelong Disneylanders visit the Florida version of the ride, it's those scenes they object to missing, and it's not just because that's what's been removed, it's because they're the lifeblood of the attraction, in a way. As my friend Michael Crawford said after experiencing the full version for the first time: Pirates isn't better in California because it's longer, it's better because it's better. Every component is improved. In a way, trying to do Pirates without the Bayou and Cavern sequence is like try to make Hamlet come off without the Ghost scenes. Yeah, the most famous scenes and quotes aren't in those scenes, but the Ghost of Hamlet is what makes the thing work, it's the little engine that the rest of the piece can trail behind. Temper with stuff like that at your own risk. Marc Davis had an astute eye for what worked and what didn't in themed design, and in a way, he was the very original student of the art which is what made him its finest practitioner. Davis shuffled a good deal of the ride around in Florida and Tokyo and he was the one who argued for a better Pirates in Florida, an argument he lost. For Tokyo Disneyland, though, he kept most of the start of the ride exactly the same as it had been in 1967. You can't improve on the perfect attraction. Pirates of the Caribbean has given us many images, many famous moments. As such, I would like nominate my favorite thing in the attraction. It isn't what you would expect. Look off to the right. These little forced perspective lighthouses appear in Bombardment Bay at the center of the attraction. I never get sick of looking at them because there's something about them that somehow encapsulates everything wonderful about the ride. They're there, off to the side, fun little details but you aren't really fooled by them. You know it's just an optical illusion but it never stops being fun to let yourself be tricked by them. And in another way, they're a perfect central image for the attraction and it is indeed serendipitous that they appear at the center of the show. Pirates of the Caribbean is the benchmark of all attractions, the one to measure up to, and so it's sort of like those lighthouses themselves. It's always there for you to come back to, always ready to be experienced again, it helps you navigate through life and art and by dint of its perfect construction is always richly rewarding. Pirates of the Caribbean is those little fires off in the night, somehow distant and close all at once. Always ready to help guide us home. I have to say, honestly, this is the BEST analysis of California's Pirates I've ever read. WONDERFUL work, Foxx. One of your best posts yet. I especially enjoyed the allusion to the fantastic "Blue Bayou" piece cut from the original Fantasia; it's my favorite vignette that never made the cut. And also,thank you for explaining the purpose of Horseshoe Parrot Island. I had always been confused as to its part of the story, but it all seems to fit together now. It's official now. You have cornered the market when it comes to themed design analysis. Excellent post! I need to get out to California to see Pirates again. The only other time I was there was in 1985 as a kid. Well, I'm with you with themed attraction-as-art. In film we sit still and images move and shift in front of us, with an attraction like PotC the images stay 'still' (mostly) and we the viewer shift around them. So if film can be art then attractions should also be given the same consideration. Do the arches serve the same purpose as a well executed cut? And like film, what we hear is used to bridge the gap and help unite the scenes. I keep bringing up film because the influence the film techniques learned by the studio were used over and over and over again when developing the park and attractions. Which I know everyone already knows, but your post has me thinking about that connection in much more literal terms. I'm finding your post raises all sorts of questions. The biggest one is - what about The Myth of Story? You may be way ahead of me here, I'm still feeling my way. It feels to me that you are saying that what makes the original PotC the greatest is that...it has a story. Are we saying that PotC borrowed more heavily from film story and structure techniques, and this is what puts it at the top of the ziggurat? Now I feel like I'm going in circles. Part of my disquiet is the ranking and ordering of things. If you asked me to choose between Pinocchio or Singin' in the Rain or Kwaidan or Miller's Crossing, I would say: I choose not to choose. I really like how you lay out the structure of the ride, how the participants are brought deeper and deeper into the ghost story until there is no place to go but down the chute and into the past and ultimately back up the chute and into the (relative) present. I apologize for the chaotic comments, you've given me much to think about. I think the point is not that Pirates has a story so much as it has a conceptually unified creative expression, and one which is, we must point out, unintentional. That's okay; I'm analyzing effects, not intent here. We experience "the idea of Piracy" in the guise of a mystery, but it's hard to call it a "narrative" and it's absolutely not a "story", which is the events of a character inside a narrative. It's much more abstract than that. It's a little puzzle for us to solve but we are at best impassive observers, possibly not even present in reality. There are no "wonderful people out there in the dark". I always interpreted the foyer as being the "museum of piracy" that was the original germ of an idea for the attraction. You pass through an elegant townhouse façade as you would at Madame Tussaud'a, and enter a large room full of portraits and props. Seriously, where are you teaching and when is the next semester starting? Maybe that is how D23 could make some money. They could hire you to lead people through the attractions firsthand! A great read, as usual! First, there is a clear analog to the long delay before you actually see a pirate, a delay filled with evidence of their presence. The same formula is used at the HM, where you don't actually see a ghost until after the Séance. Second, a bit of trivia that should fit in somewhere in the analysis. 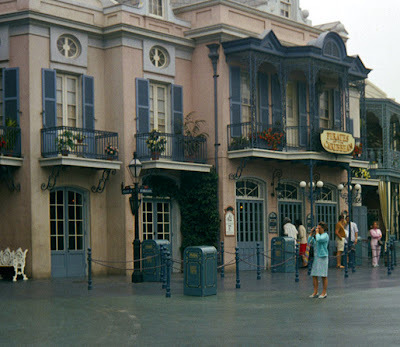 Originally, at DL, the wall on the left as you first enter, all the way up to Lafitte's Landing, had placards on it with a lot of Davis's snapshot biographies of real pirates written thereon, along with artwork that was (IIRC) not Davis's but taken from 18th-19th c. book illustrations. The placards themselves were a creamy, parchment color, no doubt to signify age. They were obviously something for people to read while standing in line, to make it less boring. They didn't last, probably because they must have been hard to fix when vandalized. I've never seen them in any photos, nor heard from anyone else who remembers them, so it's just my memory, but it's crystal clear on this. Thanks for the links, I see you've walked well down that pathway already. I'm still trying to process all this information. Excellent art rewards time and time again, doesn't it? I've read Patrick O'Brian's novels through maybe 6 or 7 times now, and looking forward to the next go round. It's been ages since I've been to the MoMA, and yet I know next time I'm there I'll be pulled into One: Number 31, 1950 and House by the Railroad . I'm thinking of something I read on another blog about the Golden Gate Bridge - that it is elegant - that it meets its function perfectly, needs no additions and will not work with subtractions. Is the best we can hope for to become impassive? I have doubts, impassivity seems to me to be a destructive constraint, especially in a place that requires life to bring it to life. Even if whimsical Cap'n Jacks popping up here and there makes me want to become impassive sometimes. That was probably the single finest piece of writing I've ever read on the subject of themed design, and on a Disney attraction specifically. There has got to be some kind of academic journal out there that we can get you published in (and I'll do my unifying essay on Tokyo's Mysterious Island so that, by piggybacking, I can get some of that pixie dust shaken on me ^_^). The first act has always been my favorite part of the attraction, followed by the overture. Besides appealing exactly to my love of ghosts and ghouls and Halloweenie things and Gothic mysteries, it struck me as essential justification for the ride's existence. 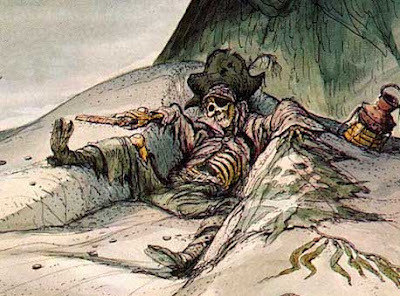 It seems to me that the beautiful artistry of PotC's circular narrative must have had its origins in the fact that pirates were fairly dispicable characters unworthy of emulation. Yet they have always provided a swashbuckling thrill for book readers and film watchers. This "wages of sin" framing sequence permits PotC to be a guilty pleasure: we can rollic with the pirates in the middle while relieving our consciences with a moral lesson well learned at beginning and end. That makes the movie-inspired vandalism all the more shameful. Besides the fact that it nonsensically doesn't even adhere to its own source material (Why is everyone calling him "captain"?) and introduces characters and technologies without parallel in the rest of the ride (Who is the squid guy? ), it makes the whole thing a thematic mess. Why are the caverns there anymore? What lesson do we learn from them? What narrative purpose do they serve? None, because Jack Sparrow makes off with the treasure at the end. Those other pirates were just unlucky, I guess. I'm surprised that they didn't make the skeletons fully animatronic, actually. The moral framework is just purile ghastliness, devoid not only of the original attraction's themes but even some of the messages of the first movie (which were themselves repudiated in PotC 2 and 3, where apparently pirates were good and the EITC was bad because they... well... I don't know. They were stuffy and British, I guess). 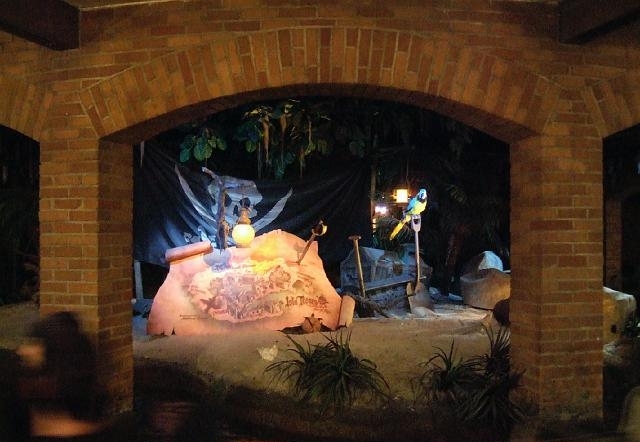 I'm very glad I was able to experience the original PotC in Disneyland USA in 2005 before they vandalized it. I saw the vandalism in Tokyo Disneyland in 2009, and it disappointed me (to say the least). Unfortunately I never quite got the chance to see Paris' version while I was there. Next time! I agree with Cory's remarks about the "wages of sin" function, allowing you to enjoy what follows guilt-free. In the 50's (not terribly long before POTC, after all), horror comics got around criticism from parental groups and avoided censorship by cynically throwing in a panel or two at the end wherein the authorities nab the sickos you've been looking at and a "crime does not pay" note is sounded. Everyone knew this was only there so you could wallow in the gore and perversity that preceded it. It's to the credit of the POTC Imagineers that their ticket to ride does not seem in the least cynical but an organic part of the show. Feels like it belongs. An epic, excellent post. Once again, your analysis is intelligent, insightful and well-presented. Being an East Coaster, I've only been able to ride the original POTC once, and even then I was too busy taking it all in to notice the details. Luckily, I'll be in Disneyland again in November. Having read this piece will make the experience even more rewarding. For that, this Disney geek thanks you. I just happened upon this blog last week and have only gotten through several entries so far but each is more amazing than the last. I am a HUGE Disney World enthusiast and reading about Disneyland's Pirates brought back wonderful memories about being there back in 2005. There are several things WDW is seriously lacking and the Pirates ride is certainly one of them. Your attention to detail is ridiculous (and I mean that in a good way). I can't wait to read more! Just wondering if you saw the new virtual ride-through of the Western River Expedition. I'm assuming you were at D23 where a model was on display, but you were the first I thought of when the announcement was made. I meant to comment on this article in my last post. Again, brilliant work. Possibly your best so far. As a writer, I feel I'll never match your style. It's very intelligent, well thought out, and unique. I would enjoy seeing you defend the recent movie characters. I feel they generally fit the themes and ideas you stressed in this article. However, do the Imagineers expect us to believe the skeletons are alive now, or what? I would also like your input about Paris's version which ENDS with the caverns. It starts in a burning fort, putting us immediately in the action. I would like to point out weepstah's point: "I choose not to choose." 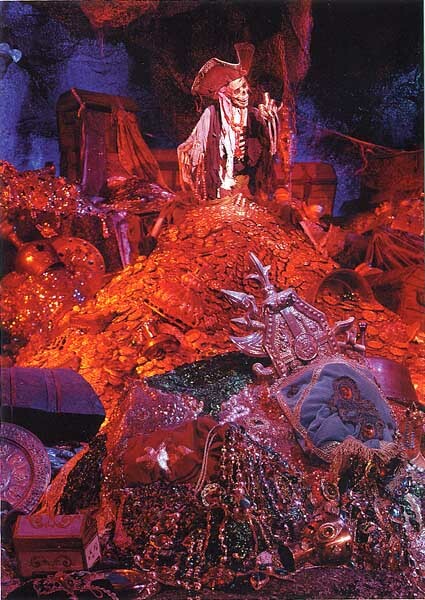 I think that calling POTC the greatest attraction, while well-justified, is quite a diss to the Mansion. The Mansion relies of what we DONT see: parlor tricks and shadows as apposed to actual figures (skeletons, etc). But, that's just my take on it. Anyway, I'm rambling. Great job as always. HBG2, I'm very excited to find out about those little plaques/descriptions for the historical pirates. My first few trips through the Disneyland Pirates left me fairly confused about that room because I kept trying to shoehorn into into a thematic framework that jives with the Florida version instead of seeing it as something that stands, in a way, outside the attraction. It's really one of my favorite introductions to an attraction ever. I think Melissa is correct in seeing this as a holdover of the "Pirate Museum" concept and a very interesting one, at that. The fact that there were once signs and other pictures making this more explicit is just wonderful news to me. I think the case for the function of the mystery caverns as a moral framework that puts the bulk of the action in its place is pretty indisputable. Pirates of the Caribbean is perhaps best understood as a morality play, much like Pinocchio (the movie) and Mr. Toad (the ride). The atmosphere of doom is established immediately and when you remove that you cut out the heart of the play, in a way. I have a sneaking suspicion, although I haven't ever been on the ride, that much like the other attractions heavily adapted for the Paris park, that the DLP version misses the mark and makes vulgar and obvious what plays very gracefully in California. The great accomplishment of the original Pirates is that it makes this essay redundant; you understand all these things in some unspoken way. That's true attraction mastery at work. Reese, I've often thought of talking about the movie additions in some detail but have always resisted because the case is pretty one sided. They work well in Florida, which is a much simpler and very incomplete attraction which they help round out and add structure to, but in Disneyland they just misfire or hardly impress. 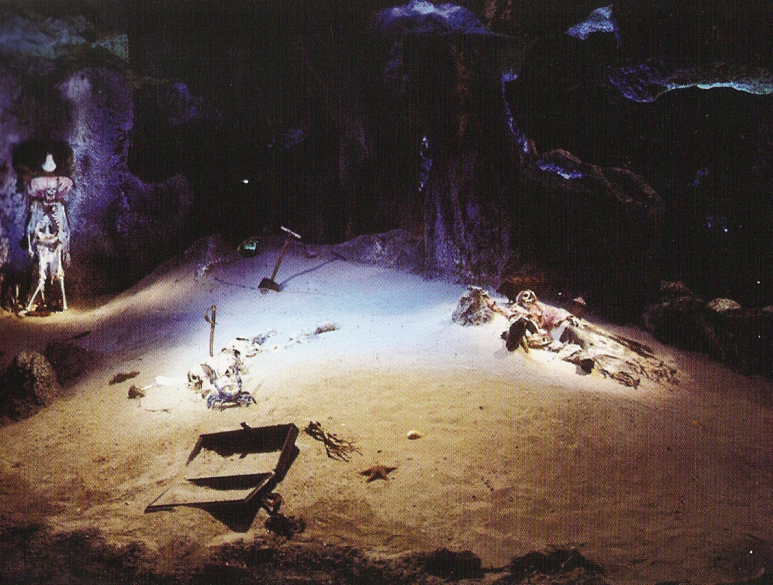 The very best thing that can be said about that stuff in California is that the addition of the movie figures meant that a lot of ill-advised stuff from the 90s got stripped out, such as amateurish lighting in the caverns and some poorly used leftover figures from World of Motion. This stuff really detracted from the ride, whereas the movie stuff only slightly detracts, and in certain regards returned original 60s era WED staging, lighting schemes, and colors. I think it's sort of a wash out there. We can keep going! :D comment, comment, comment! I re-re-read your Florida pirates article, and.. Awesome post, and I realized that by the time i got to the load area in Florida, seeing that lonely ship out in the harbor, I have already totally bought in because of the queue and exterior design. It may sound like sacrilege, but I wonder if a reworking of the caverns section to follow the theme of the queue..ie, more scenes about the impending attack.. would better serve the Florida version. As you have pointed out so well, the DL and WDW Pirates really are totally different experiences. Post by post you are laying out the bones and flesh of how to appreciate WDW in a tremendously satisfying and stimulating way. Bringing it to life the way you do is a special talent. Somehow, on my first reading of this, I missed or skimmed the spoiler warning. I grew up in Florida and still haven't been to Disneyland, so oops. Honestly, if I'd caught it, I would have read on; I can't resist these essays at all. Thank you so much for this blog. I am an artist (working in total obscurity in Ohio) and Disney informs so much of what I do. Your rigor and insight has me re-approaching Disney as source material, always turning the imagery over in my hands and trying not to take any moment of detail for granted. Your work here is inspiring, hilarious, and ultimately reassuring. I fully agree that the Disneyland version of PotC is far superior to the Disney World version. Still, I can't accept your assertion that "trying to do Pirates without the Bayou...sequence is like try[ing] to make Hamlet come off without the Ghost scenes." You make a good argument earlier in your essay for the purpose of the bayou prologue, but I can't get over the fact that the juxtaposition of what is clearly a NINETEENTH-century LOUISIANA bayou with an EIGHTEENTH-century CARIBBEAN town makes absolutely no logical sense. It's as preposterous as the turn-of-the-century Scott Joplin ragtime soundtrack played throughout the 1930s-set movie "The Sting." Sure, it may SEEM to "work" and be be perfectly "logical" to us, but it's just because we've grown up with it this way and have never truly thought long and hard about it. Disney World's PotC may be a pale shadow of the original, but at least its placement in Caribbean Plaza makes sense. True, the bayou prologue to Disneyland's PotC is atmospheric Disney imagineering at its best, but it's misplaced and doesn't make a lick of sense. I love your blog and was so surprised to see Dungeon Rock mentioned, which is literally walking distance from my house. Keep it up with the awesome, insightful journalism/archivism.